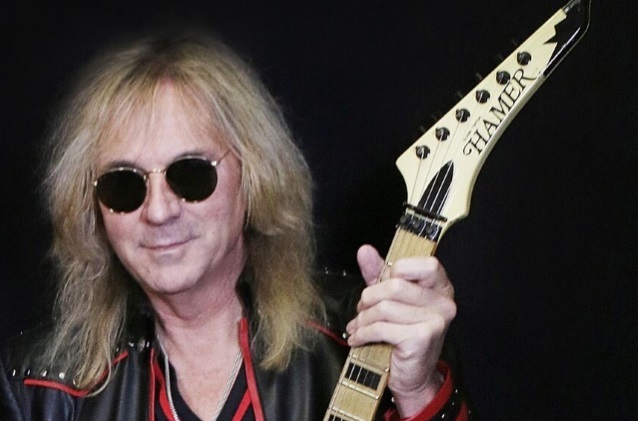 Judas Priest’s Glenn Tipton has launched the Glenn Tipton Parkinson’s Foundation in an effort to raise money for new technology that can help treat Parkinson’s disease. This news comes after Tipton was forced to step away from touring due to his struggles with the disease. The band have since moved on with producer Andy Sneap filling in, though Tipton still makes occasional appearances. “As you probably know by now I’ve had to pull out of the current Priest tour due to ill health – I am still doing some shows and joining the guys on stage for some songs and will carry on for as long as I can without compromising the band . So far when I walk on stage the audience reaction has been amazing, heart warming and quite emotional……. This entry was posted in Judas Priest, News and tagged Glenn Tipton, Glenn Tipton Parkinson’s Foundation, Judas Priest, Metal. Bookmark the permalink.